Please check out my Localite TV interview about the Little Louie Toy Company! Please read our interview with the Outlook newspaper! Parents and educators know the best way to teach children about important issues is to bring the information to their level. And who better to introduce environmental awareness and protection than two pint-sized mythical creatures who stumble upon dangers to their own home. 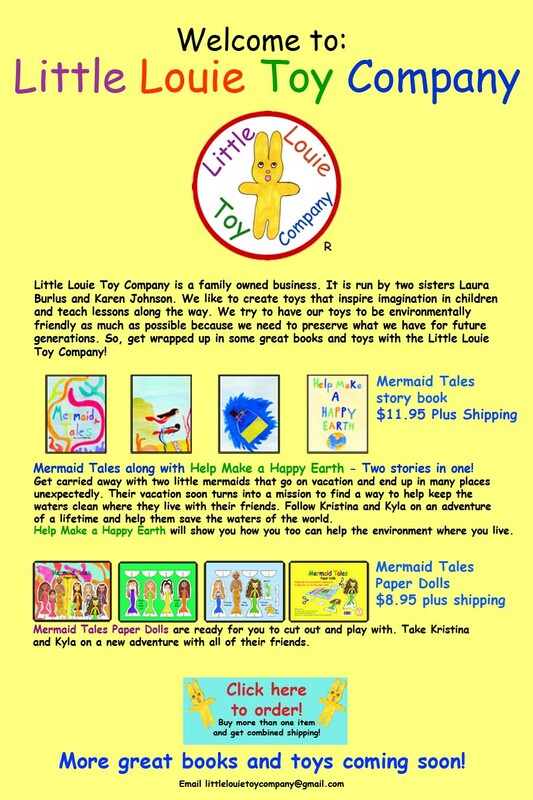 “Mermaid Tales” is the first in a number of children’s books and toys planned by Burlus and sister, Karen Johnson, owners of the Troutdale-based Little Louie Toy Company. Designed to be environmentally friendly, the books are printed locally and made from soy-based inks and recycled paper. A portion of each book sale is also donated to a charity, selected to reflect the book’s theme and support environmental causes. But being kind to Mother Nature isn’t something new to the sisters. Born and raised in southeast Portland, they learned to preserve and respect the environment through their father’s example. Burlus remembers being devastated after her favorite tree near the family’s home was cut down when she was 8 years old. The experience set a course for personal conservation and a way of life. “Mermaid Tales” and its accompanying paper dolls (sold separately), are a way for children to take the story they’ve heard or read and apply it through creative play, Burlus said. They identify with the characters, no different than Mickey Mouse or Dora the Explorer, and want to emulate the lessons they teach. Each successive book and related toy planned by the duo addresses other facets to the environmental issue. “Martini Racer,” scheduled for a fall release, is the story of a gas guzzling racecar that becomes an electric vehicle. Johnson recently completed the story of Little Louie, the company’s namesake, which tells of a bunny who builds a birdhouse for some homeless feathered friends using debris dropped by humans in a park. The sisters’ mission isn’t limited to books and toys, however. Someday, they hope to open an educational amusement park based around the books’ characters. The venue would not only allow children to get up close and personal with Kyla, Kristina and their friends, but would also be a model for an eco-friendly and self-sustaining entertainment facility. Burlus and Johnson both respect those who strive to preserve the world around us but believe grassroots efforts and education can make a larger impact. What: Upstart Troutdale company, featuring environmentally-friendly children’s books and toys. The book “Mermaid Tales” sells for $11.95 and is available online or at the Troutdale General Store, 289 E. Historic Columbia River Highway. Accompanying paper dolls retail for $8.95. $1 from the sale of each book and/or paper doll set benefits Eco-Justice Team Cascades Presbytery, Restoring Eden and The Oregon Center for Christian Values.